A £14m environmental distribution centre built for a Suffolk brewery has started operations. Adnams Brewery in Southwold has transformed a disused gravel pit set within 85 acres of grassland on the outskirts of the town. The building at Reydon supports the biggest green roof in the UK, solar panels provide 80% of the hot water and reed beds purify the waste water. The centre will also reduce the number of heavy goods vehicles in Southwold. 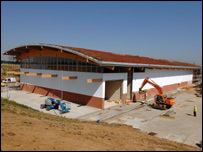 The roof helps to regulate the internal temperature and provides a rainwater catchment area to supply water for the site. All the walls are built from blocks made of lime, quarry waste and hemp. A spokeswoman for Adnams said the building was designed so that from the road it appeared to be part of the countryside. "Over 90,000 lime & hemp blocks were used in the construction, making this the biggest building in the UK to use this material. "The building is about 15% more expensive than a traditional 'metal box' warehouse, but the additional investment is justified in the long term by significantly lower energy usage and greater efficiency."